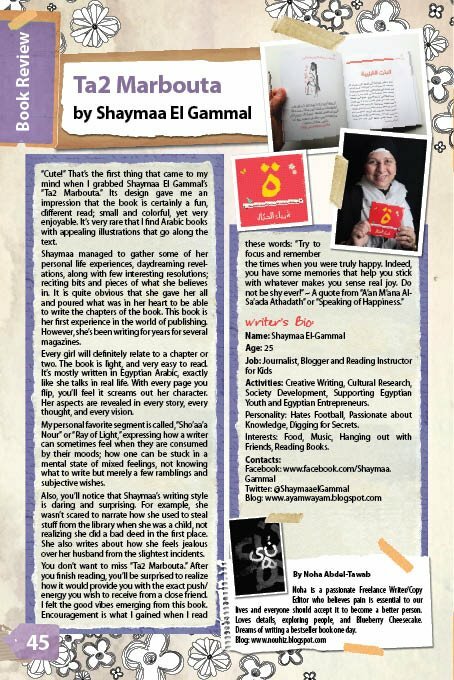 The Moon Is My Home | .. N.O.H.A ..: Book Review: Shaymaa El-Gammal's "Ta2 Marbouta"
Book Review: Shaymaa El-Gammal's "Ta2 Marbouta"
Cute! That's the first thing that came to my mind when I grabbed Shaymaa El Gammal's "Ta2 Marbouta." Its design gave me an impression that the book is certainly a fun, different ride; small and colorful, yet very enjoyable to read. 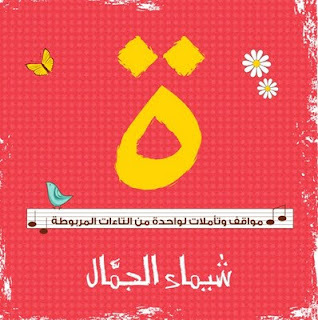 It's very rare that I find Arabic books with appealing illustrations that goes along the readings as well. So, here's what I thought about the book after reading it cover to cover. Shaymaa managed to gather some of her personal life experiences, day-dreaming revelations, along with few interesting resolutions; reciting bits and pieces of what she believes in. It is quite shown that she gave her all and poured what she had in her heart to be able to write the chapters of this book. This book is her first experience in the world of publishing, however she's been writing for years now as a journalist in several magazines. Every girl will definitely relate to a chapter or two. The book is light, and very easy-to-read. It's mostly written in slang Arabic, exactly like she talks in real life. With every page that you flip, you'll feel it screams out her character. Her aspects are revealed in every story, every thought, and every vision. My personal favorite segment is called, "Sho'aa'a Nour" or "Ray of Light," expressing how a writer can feel sometimes when he/she can be consumed by their moods; how one can be stuck in a mental state of mixed feelings, not knowing what to write but few ramblings and subjective wishes. 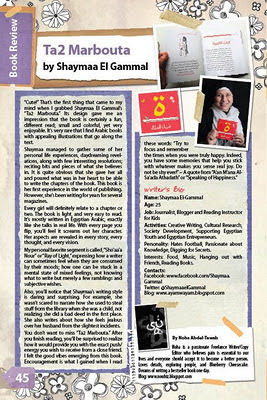 Also, you'll notice that Shaymaa's writing style is daring and surprising. For example, She wasn't scared to narrate how she used to steal stuff from the library when she was a child, not realizing she did a bad deed in the first place of course, or how she gets jealous at her husband from the slightest incidents, like drinking a cup of cocoa that gives him warmth or sleeping on a pillow that may hold his head all night long. You don't want to miss "Ta2 Marbouta." After you finish reading, you'll be surprised to realize how it would provide you with the exact push/energy you wish to receive from a close friend. I felt good vibes coming out of this book. Encouragement is what I gained when I read these words: "Try to focus and remember the times when you were truly happy. Indeed, you have some memories that help you stick with whatever makes you sense real joy. Do not be shy ever!" ~ A quote from "A'an M'ana Al-Sa'ada Athadath" or "Speaking of Happiness." Book is looking good .